PSR Automation Inc. creates Quality Custom Designed Machinery to fit the Manufacturing Industry. We offer easy to use solutions, with maximum quality. Download the PSR Automation Inc. Line Card with Standard Products. 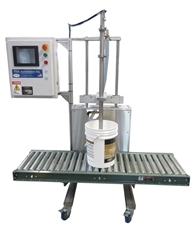 The PSR Automation Inc. Rotary Over Capper places over-caps onto containers at speeds up to 80 CPM. The simple design utilizes a single bottle and cap star wheel for minimal changeparts. The 4-finger pneumatic chuck smoothly picks and places overcaps onto the bottles. Patented High speed sorter, handles a wide variety of caps. The S3F Servo Filler is a machine designed for startup companies or those looking to complete small runs with minimum setup time. High Capacity 30GPM Servo Filler. Fill a Pail in about 15 seconds! 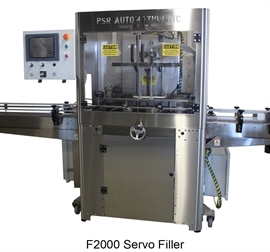 Servo Filler gently displaces product for the best fill possible. Perfect for soaps and other foamy products. 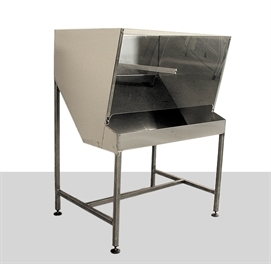 EL500 Conveyor / Elevator can be used as a takeaway conveyor or as general purpose material handling for bags, pouches, and other loose items. The standard design is low profile and availble in multiple elevations. 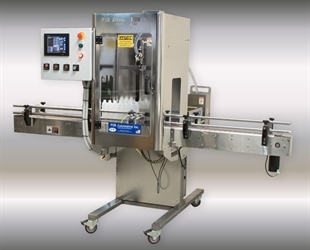 PSR Automation Inc. displays a new style of machine at PackExpo; the Dual Lane Continuous Motion Filler. Up to 160BPM, 15 minute changeover, and simple controls. A special lighting effect was employed, giving the appearence of water being filled. Make hand loading bottles easier with a Bottle Hopper. Unit can be adjusted to conveyor height reducing operator fatigue.